Washington DC's Statehood - featuring ex-Dismemberment Plan members Eric Axelson and Joe Easley - are playing Reggie's Saturday, March 22 with Chicago bands Kid, You'll Move Mountains and Picture Books. Click here for show details and tickets. 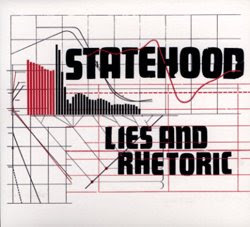 Statehood recently released their debut CD Lies and Rhetoric, a tight, consistently rocking set of songs. This disc starts off with the one-two punch of A Story's End and Giants - both pulsating with the Axelson-Easley rhythm section and the commanding vocals of singer Clark Sabine - and never lets up. My personal favorite cut is Still Spinning, which mixes a more melodic chorus with the same driving aggression present throughout the album. 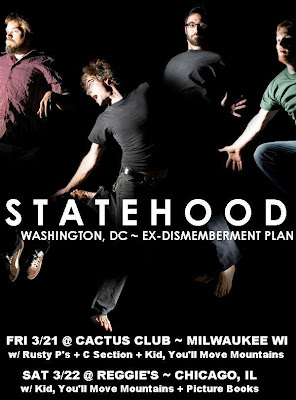 Check out some of the tracks for yourself on Statehood's MySpace page. Chicago band Kid, You'll Move Mountains is currently working on their debut album, planned for release this summer. The band is made up of ex-members from various acts such as Troubled Hubble, El Oso and Inspector Owl - not to mention a classically-trained pianist - and plays lively, intricate indie pop featuring co-ed vocals. Check them out on MySpace. 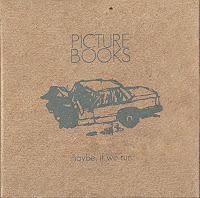 Five-piece energetic indie pop outfit Picture Books is also from Chicago, and meshes its core of guitar, keys and drums with an assortment of lesser-used instruments such as melodica, ukulele, omnichord and glockenspiel. The band released its debut LP, Maybe, If We Run, in September 2007. You can listen to a few of the album's cuts on the Picture Books MySpace page.